LISBON - Do you know a better place to learn a new language? When we say that Lisbon is the best place to learn a new language, we do not just mean all the things that the city center can offer you, such as beautiful old neighbourhoods plenty of mysterious stories, imposing historic buildings and monuments, lookouts with trendy and fancy restaurants and bars, where you can have a meal or a drink while enjoying the view over the city and Tagus river, but you can also find some of the best beaches in the world. No, we don't like to brag! It's the truth! Here is a list of some of the dazzling Lisbon beaches where you can soak up the sun! Some are little paradises, others are havens for surf lovers! What are you waiting for? Pack your bags and fly to Lisbon for an unforgettable language learning and summer experience. Certainly you will have loads of fun during and after the Portuguese classes! Blue, green, and calm water! The perfect beach postcard you want to take home to show to your family and friends! The most beautiful! Despite the access being an adventure itself, the beauty of this beach lets everyone marveled! Praia do Castelo is one of many beaches of the vast sandy coastline Costa da Caparica. It is not so popular amongst the foreign people as the beaches of Cascais/Estoril coastline, but the Portuguese flock to Costa Caparica in the summer because of the family atmosphere, late-night beach parties, and many miles of sand of this amazing seacoast. 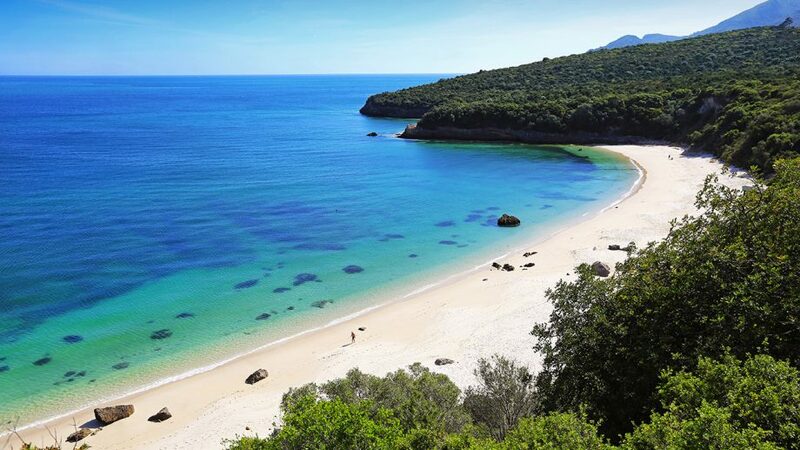 This beach is located next to Lisbon and you can take the train (from the city center) or simply enjoy the seacoast by car, both ways are really fast! In this very accessible beach, you can do a bunch of funny sports including surfing, kayaking, kite surfing, and go for a jet ski ride! Windy with sandy and green tones' cliffs, this is a "Must" for kite and windsurf lovers! Known for its sinuous sea, even James Bond dove in its turbulant waters in one of "007" movies. Please be aware that this is a very short list because there are many other options if you want to go to the beach in the surroundings of the capital of Portugal. Portuguese Connection language school will offer you the opportunity to learn one of the most spoken languages in the world while enjoying the summer as you never did before! For more information about our classes, please click HERE!